BURLINGTON, Colo. – Even though he has retired before his title now, Cory Wall will forever be a bullfighter. These days, though, his focus is closer to home. He’s added a few more titles to his name: Kit Carson County Commissioner, rodeo producer, husband and dad. They all matter to the Burlington man, and he puts them all together with the Kit Carson County ProRodeo. 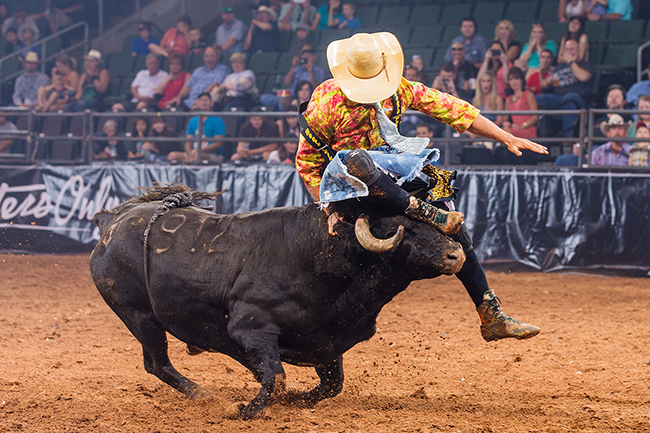 He introduced freestyle bullfighting to the hometown crowd four summers ago, and this year he is teaming with Bullfighters Only to put on a tour event, set for Friday, July 29, in Burlington. “As a bullfighter, I’ve always felt like what I did and what other bullfighters did was something you don’t see at every other rodeo,” said Wall, the 2009 Professional Rodeo Cowboys Association’s Bullfighter of the Year. “I knew that most of the people in my community had not seen what we could do. That appeal is the guiding force for Bullfighters Only, which is in its inaugural season. Bullfighters utilize their tremendous athleticism to try to outwit and outmaneuver equally athletic bulls, which are bred specifically for this type of fight. “I helped the BFO out in Vegas last December, and it looked like they had their stuff together,” Wall said. “They’re doing a great job of marketing and advertising and really selling that industry. All those things are attractive to the men who do this for a living. Flatt will be one of five bullfighters that will compete for the Kit Carson County ProRodeo Bullfighters Only title. Burlington is the 17th of 30 regular-season stops for the elite group of men who make up the BFO. In fact, that’s what Wall liked most about having the BFO be part of his hometown event. Flatt has showcased his talent before the Burlington crowd before, and he’s excited to make his return. “I went to his bullfight two years ago, and it treated me really good,” he said. “It was a great rodeo and a great crowd, and it was an outstanding bullfight. That’s just what Bullfighters Only is all about, and fans in Burlington will reap the rewards.